Remodel your bathroom and give your entire home a facelift. By renovating, you’ll create a space that actually works for you – not the other way around. Whether you’re looking for a few simple changes or an entire transformation, we can help. For us, the consultation process is important. We spend the time to get to know your needs, taste, and budget. From classic to contemporary and everything in between, we can bring your bathroom to life. You won’t get a cookie-cutter solution. Instead, something that perfectly replicates what you envision your space to be. If you’re looking for a local renovations company specialising in bathrooms, call us. We’ll come out to your Geelong home today. Bathroom additions. Invest in a renovation. Got photos of your dream bathroom? Need help bringing all those ideas to life? This is what we’re here for. We dedicate plenty of time to the consultation process. Let’s sit down and start planning your new bathroom. Are there certain features that you’d like to include? What about problems you’d like to solve? We’ll consider all of these things during the design process. At times, you’ve surely dreamed of the type of ways you can update your space. Our team can turn those ideas into a reality. The price of updating your bathroom will depend on a range of factors – the size of the room, the type of fixtures you choose, the price of labour, and if any preparation work needs to be done. The best thing to do is book a free consultation with us to find out the cost of transforming your bathroom. Our prices are competitive and we only use premium products and materials. We offer a range of services including installing decorative tiles, custom vanities, painting the space, waterproofing, and many other tasks. While parts of a renovation you can do yourself, it’s best left to the professionals. A task like waterproofing your bathroom requires specialised knowledge. The last thing you want is to have issues such as damage down the track. 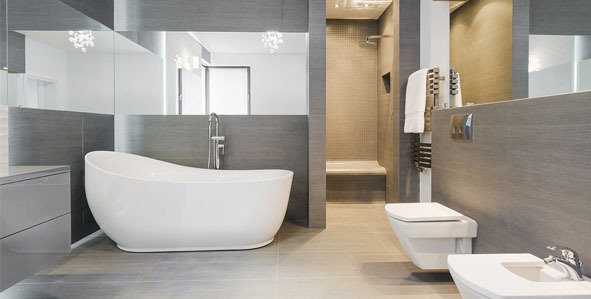 Our team offers cost-effective bathroom remodelling services. Our experienced tilers can begin the transformation from the ground up. We’ll ensure your floor and wall tiles are installed correctly, following waterproofing methods. By installing new tiles, you can completely modernise the look of the space. With a few new fixtures, you won’t be able to recognise it. You don’t need to outlay thousands of dollars if you don’t want to. Utilise our industry knowledge to remodel the space in the most economical way. Every renovation project we work on is different. We don’t offer cookie-cutter solutions. Your bathroom update will match your lifestyle needs. Whether you’re working with a blank canvas in a new house or simply want to add a few modern features to your current bathroom, talk to us. Our experienced bathroom designers can work with you, regardless of your situation. If budget is a concern, tell us what you’d like to spend and we’ll offer solutions that match. We believe you shouldn’t have to wait decades to live in that dream bathroom. While renovations can seem like a big decision to make, if you choose the right team to execute it, that makes the world of difference. Choose us, for stress-free bathroom updates. Ready to discuss your remodelling ideas? Contact us today and we’ll organise a time to visit your home in Geelong VIC 3220. Every renovation we work on is completed to the highest industry standard, using modern design methods.